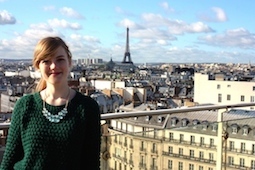 Check out my blog post of all the best things to see and do in 24 hours in Paris. 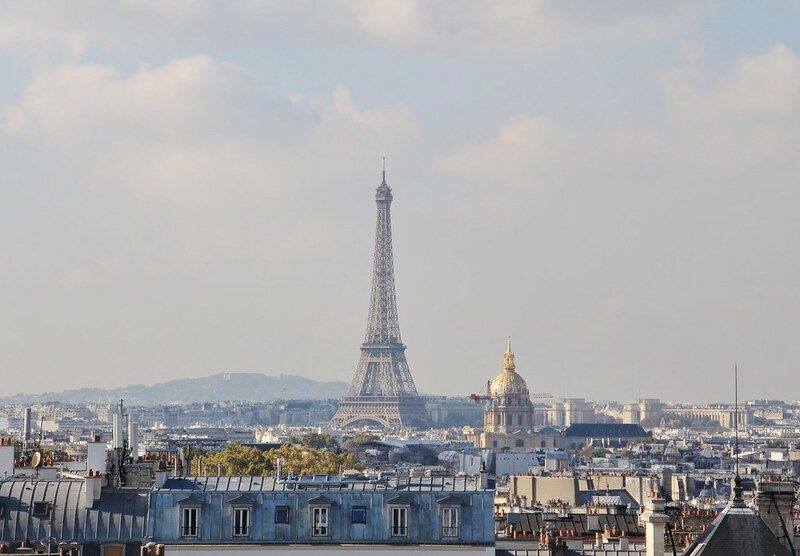 Get away from the tourists and head over to the secret gems that Parisians don’t want you to know about.Inspired by Accor Hotels “24 hours in…” competition, I have decided to write up the best things to see and do in 24 hours in Paris. 24 hours is not a lot of time, and there is so much I would recommend seeing. However, I have done my very best to offer you, lovely readers, the best that Paris has to offer. One thing I tell anyone going to Paris is to forget the metro. Ok, so the metro is fine, but to really experience a city there is no better way than walking, especially in Paris. Therefore, this guide takes its inspiration on how close the various sites/sights are to one another. 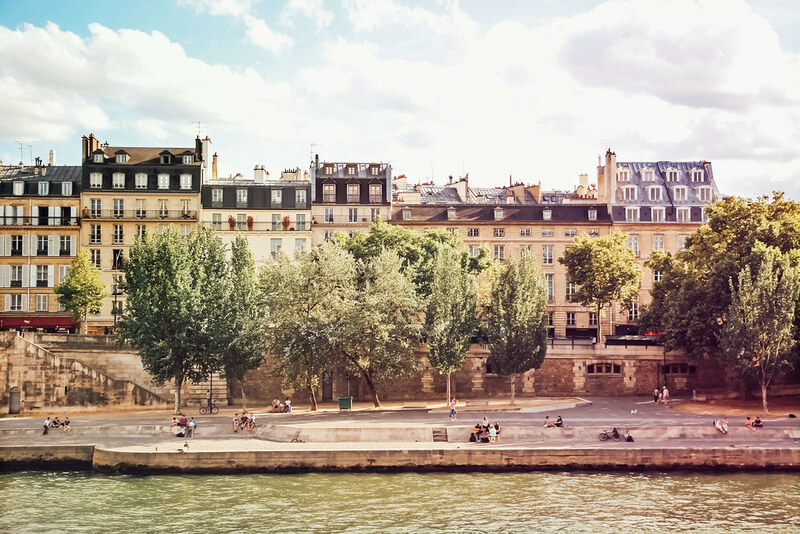 Bunched together in terms of location and arrondissement, this guide offers you a great insight into the beautiful city of Paris, whilst offering you things off the beaten track! To make life easier and show you that you can do all the things mentioned here in 24 hours, I have created a map showing all the places listed in this guide, and some great places to eat and drink nearby. 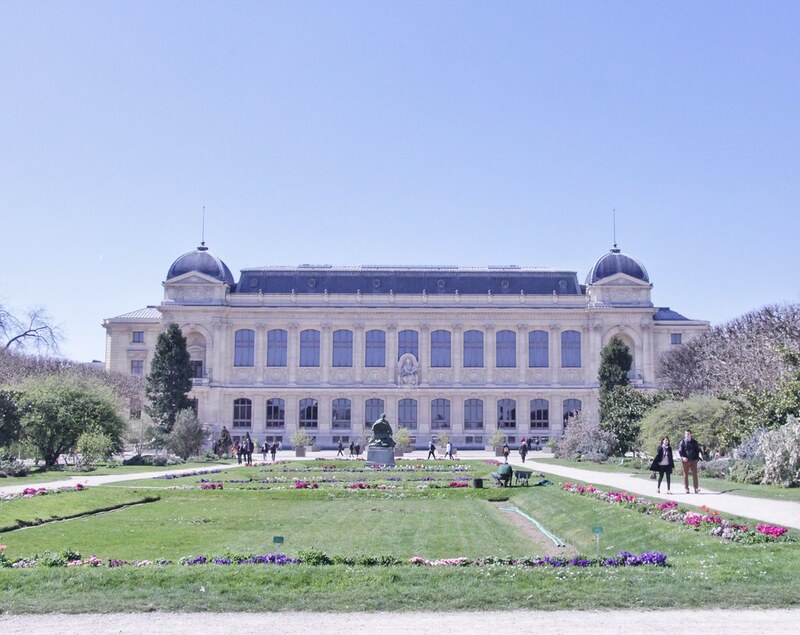 One of my favourite places in Paris is the Jardin des Plantes, and I would begin my day exploring the grounds and taking in the beautiful sights. 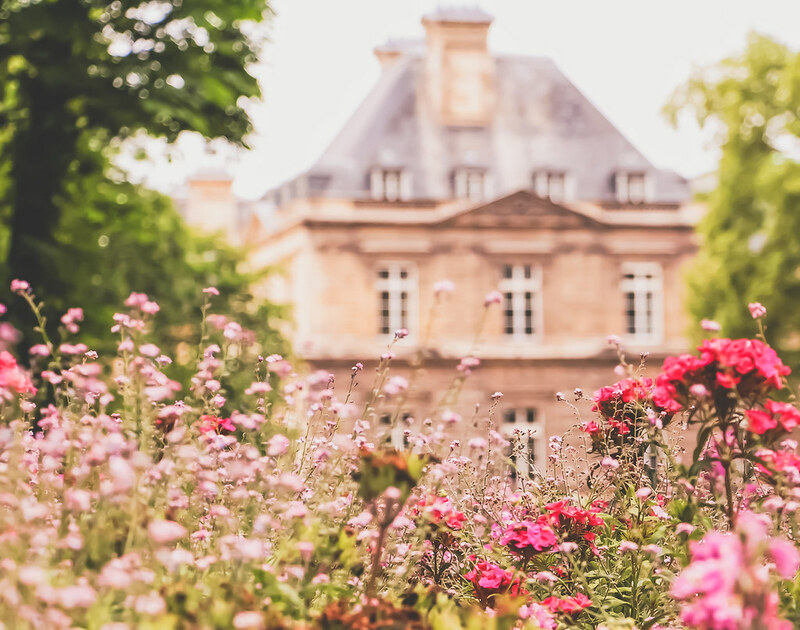 Located in the 5th arrondissement, the garden is a paradise for gardeners and flower lovers alike, especially during the spring when the garden is in full bloom. There’s a lot you can see and do here in the Jardin des Plantes. Not only is there a beautiful botanical garden, but a zoo and a Natural History Museum. 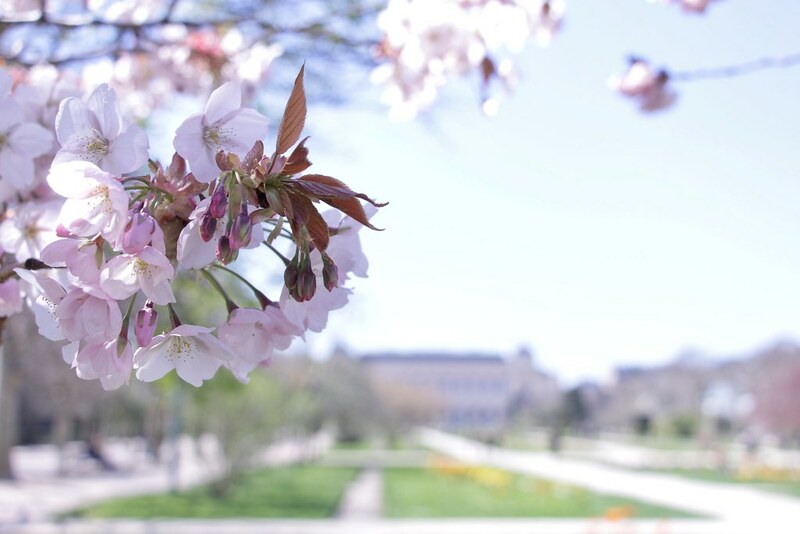 Walking around the garden is free and definitely worth it, especially as the Jardin des Plantes seems to have escaped the radar of tourists, making it an ideal place to escape the rush of the city! – but shhh, don’t tell anyone else about it. Located a stone’s throw away, at the south-western edge of the Jardin des Plantes, is the next place on the guide – the Grand Mosquée de Paris. 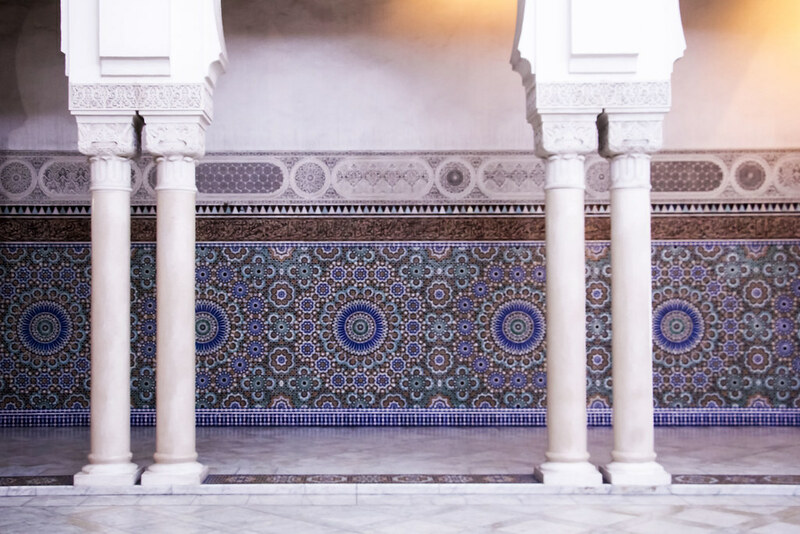 Similar to the Jardin des Plantes, the Grand Mosquée is often off the radar for tourists, and you may not have heard about it at all. 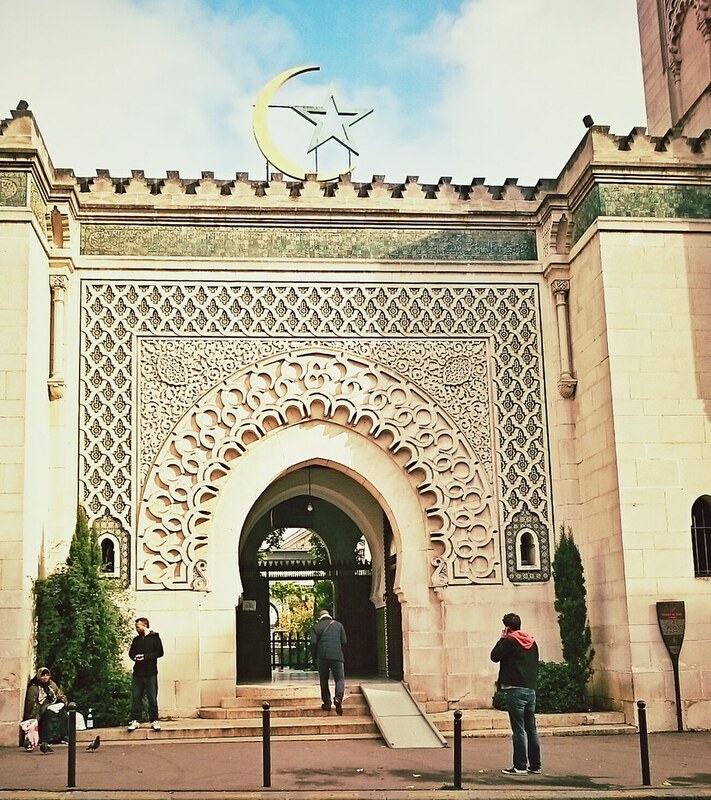 Founded in 1926 after World War I, it is one of the largest mosques in the whole of France. Visitors are allowed to explore the mosque as long as they are respectful to worshipers attending daily prayers. The decoration and architecture are beautiful, and it’s hard to believe that you’re in the middle of Paris, as you almost feel transported to another country. After exploring the stunning courtyard and the rest of the Mosquée, head over to the Mosquée’s very own restaurant and café. Here you will be transported on an amazing culinary journey, as you can feast on a variety of Middle-Eastern pastries and mint tea. Depending on how busy the tearoom is you can either sit inside or enjoy the open courtyard. Sticking to the 5th arrondissement, the next stop of this tour is a visit to the Panthéon. Originally built as a church dedicated to hold the relics of Saint Genevieve, the Panthéon is now a secular mausoleum. The architecture is stunning, and the interior matches up to the exquisite exterior design. After taking some time to catch your breath and take in the sights, the most important thing to see and do in the Panthéon is to climb the steps upwards to the recently opened viewing deck at the top of the Dome. The walk itself is very easy and worth it. The view from the top of the Panthéon is absolutely breathtaking. What I love about this view is that not only do you get great views of the entire city but that again, it seems to be off the radar for many tourists. 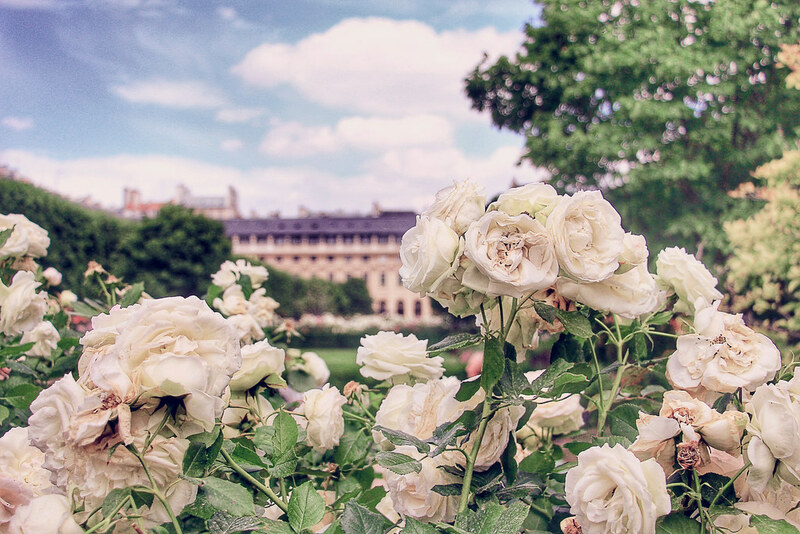 No visit to this part of Paris would be complete without a visit to the Jardin du Luxembourg in the nearby 6th arrondissement. 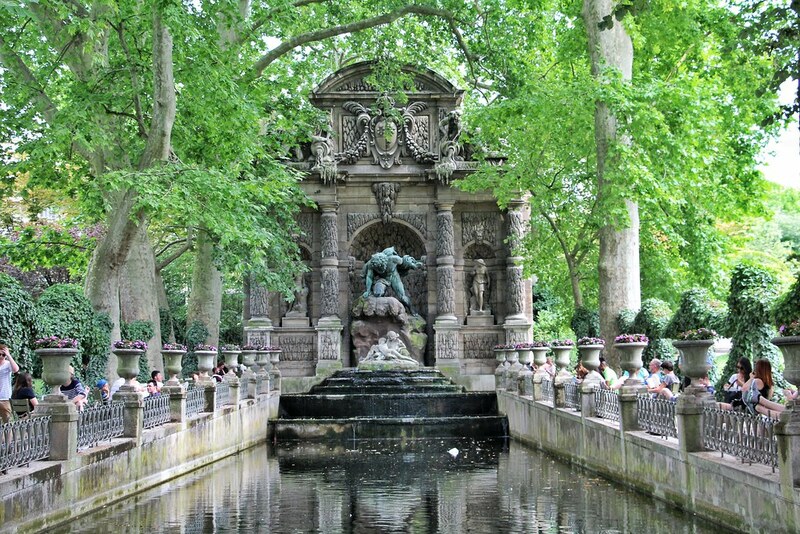 A five-minute walk from the Panthéon, the Jardin du Luxembourg was created in 1612 by Marie de’Medici for her new residence. The garden is beautiful, with a variety of things to see and do. You can walk along the geometric lined paths towards a delightful fountain in the middle, directly opposite the Palais du Luxembourg. Here little boats can be rented and raced against once another and is a great place to grab one of the many chairs and relax. There’s also the Pavillion de la Fontaine Paris where you can get some food or drink, and if you’re lucky, listen to music from the nearby pavilion which is often frequented with a variety of musicians and bands. Chez D, 220 Rue Saint-Jacques, 75005 – some great vegan options and super cute interior. Bread and Roses, 62 Rue Madame, 75006 – delicious pastries and croissants! Café de Flore, 172 Boulevard Saint-Germain, 75006 – this was a popular place for writers and artists, including Picasso who was a regular. They have the most amazing hot chocolate. Un Dimanche à Paris, 4-6-8 Cours du Commerce Saint-André, 75006 – a lovely place for brunch. Odette, 77 Rue Galande, 75005 – Odette is a small and very cute spot, which serves delicious chop pastries filled with cream and other flavours. A definite try is nearby. After exploring the 5th and 6th arrondissement, I would recommend strolling across towards the Ile de la Cité where my favourite place in Paris is. 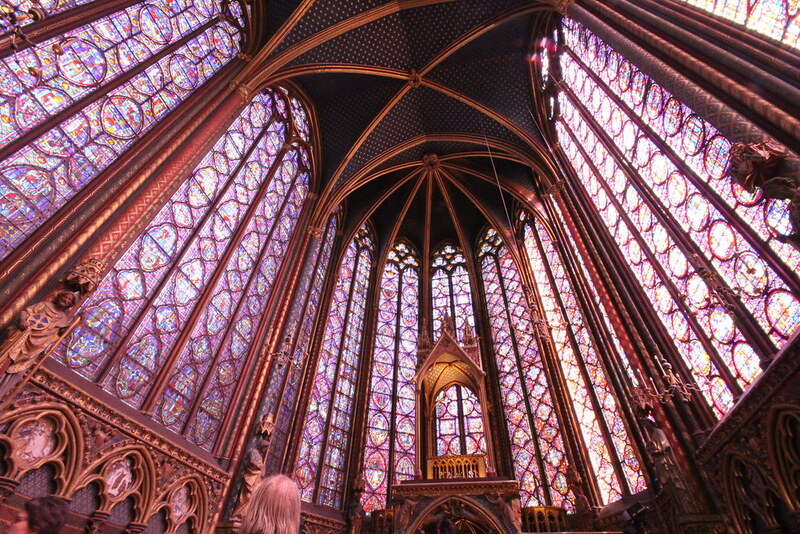 It still dismays me that the Sainte-Chapelle is often overlooked by those coming to visit Paris. 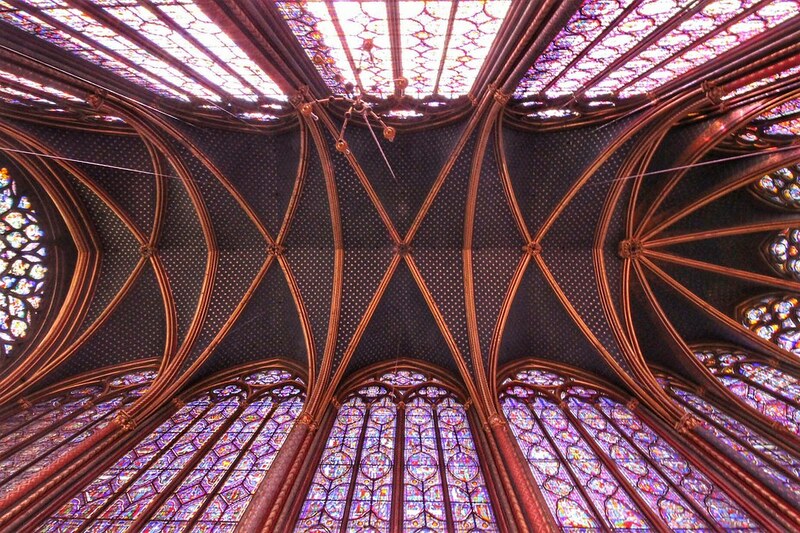 Built to house the sacred relics of the Crown of Thorns in 1248 under the patronage of King Louis IX (aka Saint Louis), for me, the Sainte-Chapelle is one of the most beautiful places on earth. The upper chapel is surrounded by the most exquisite stained-glass, which one can look at for hours. In addition to visiting the chapel during the day, you can also attend various classical concerts in the evening – another must do. Like I said, Paris is a city made for people to stroll around, and after visiting the awe-inspiring Sainte-Chapelle a walk along the Seine is a must. There’s honestly nothing better than an aimless promenade, capturing the different views of the city. A promenade along la Seine, no matter what the season, is always a delight. Walk past Notre-Dame Cathedral (pop in if time is on your side! 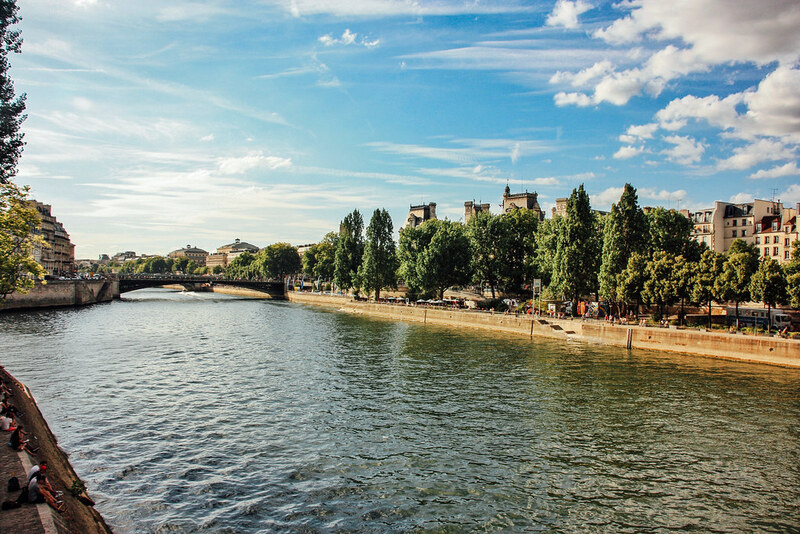 ), head across Pont Saint-Louis and Pont Marie and head towards the next place on the guide. The Place des Vosges is situated in between the 3rd and 4th arrondissement of Paris, and is one of the oldest squares in Paris. At the centre is a delightful park where one can go for a stroll along the tree-lined paths. 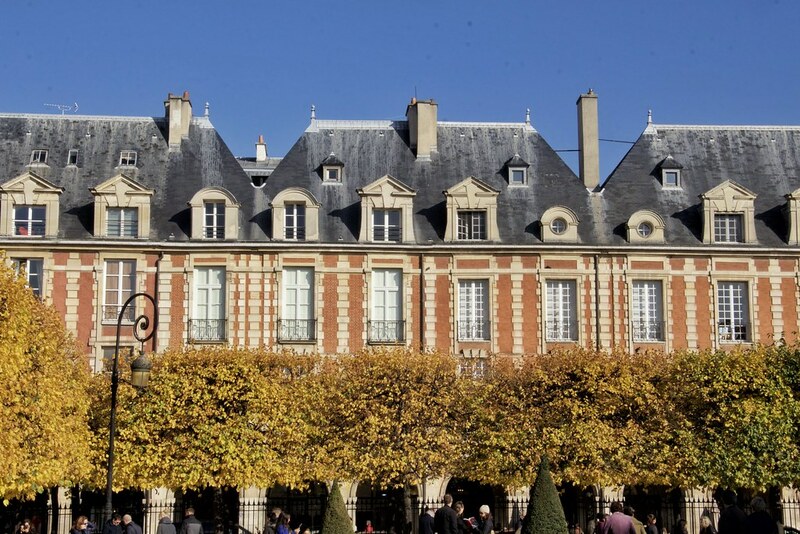 The Place des Vosges was originally called the Palace Royale, built by Henri IV between 1605 to 1612. The buildings adorning the square are beautiful and charming, and I only dream of one day living here! The Place des Vosges is also known for many famous people who have called this place home, including Victor Hugh from 1832-1848 where there is currently a museum devoted to his memory. 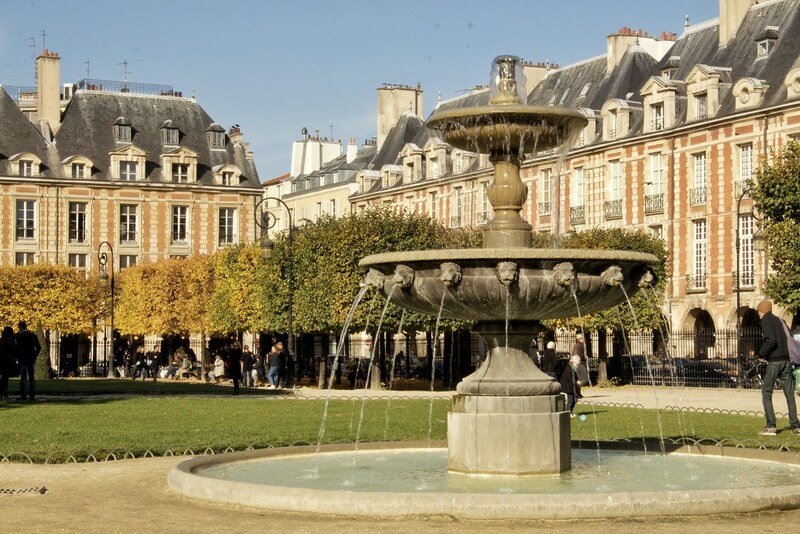 The Place des Vosges is the perfect place to bring a coffee, croissant, and book and to just enjoy the scenery. L’improbable, 5 Rue des Guillemites, 75004 – this is one of my favourite cafes in Paris. Inside you are greeted with a food truck, and lots of places to sit, including swings! The food is great, and there’s lots of drinks available. Fragments cafe, 76 Rue des Tournelles, 75003 – tucked away in the Marais, this place serves great coffee. It is a super cute cafe, and worth a visit. Marché des Enfants Rouges, 9 Rue de Beauce, 75003 – a definite must in Paris. This market place has a great mix of stalls and cuisines to choose from. There is delicious Japanese, French and Moroccan food. Something for everyone. 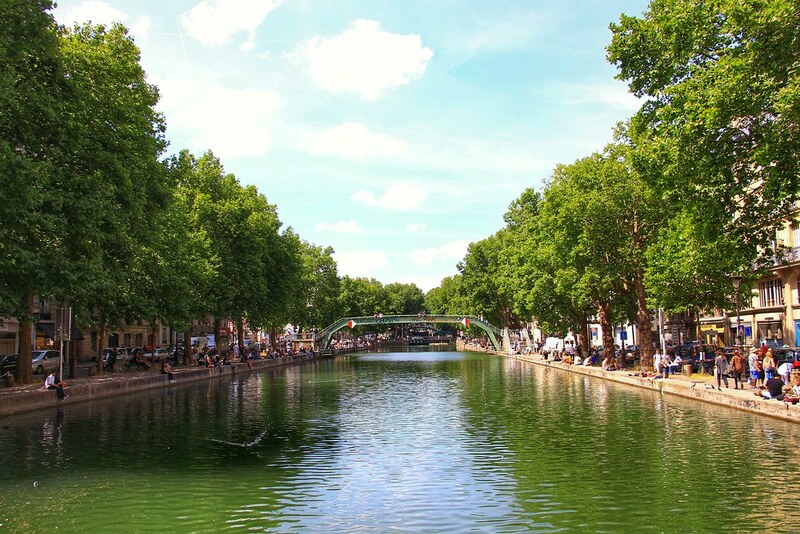 After potentially grabbing a bit to eat, or perhaps a look through some of the cute little shops nearby, a must when in Paris is a visit to the Canal Saint-Martin. 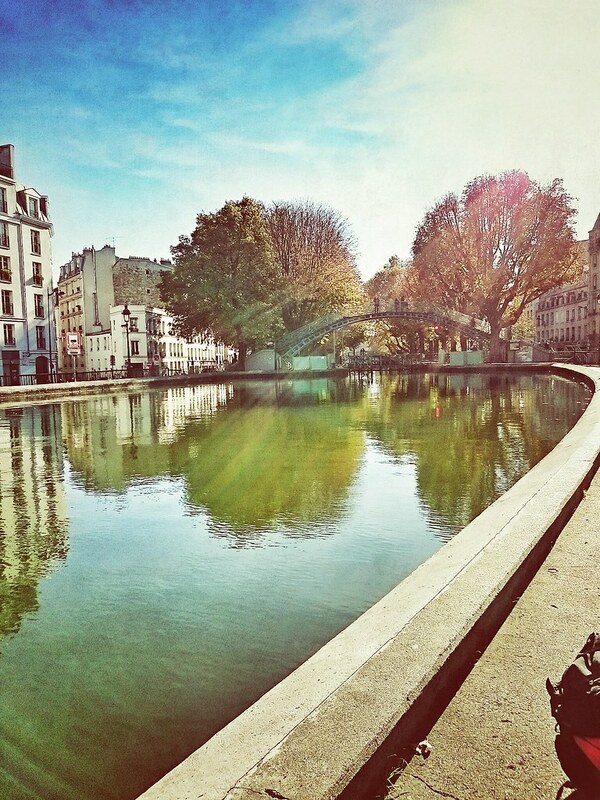 Situated in the 10th and 11th arrondissements, the area surrounding the canal is super cool and hip. Parallel to the canal are a plethora of cute cafes and shops, and also a tonne of vibrant street artwork. Exploring this area of Paris will make you feel as if you have been transported to Amsterdam. Whether it is autumn or summer, it’s a lovely place to sit down and just people watch. Café Smörgås, 11 Rue du Château d’Eau, 75010 – this scandi place servers great food, perfect for brunch or lunch. Holybelly, 19 Rue Lucien Sampaix, 75010 – this is a friendly and cute cafe, which has awesome coffee and yummy food. Du Pain et des Idees, 34 Rue Yves Toudic, 75010 – this is a fantastic bakery, with an amazing array of pastries on offer. The chocolat pistachio escargot is a must try! The Sunken Chip, 39 Rue des Vinaigriers, 75010 – firstly, how awesome is the name of this place?! And yes, pardon the pun, for this is a fish and chip shop! 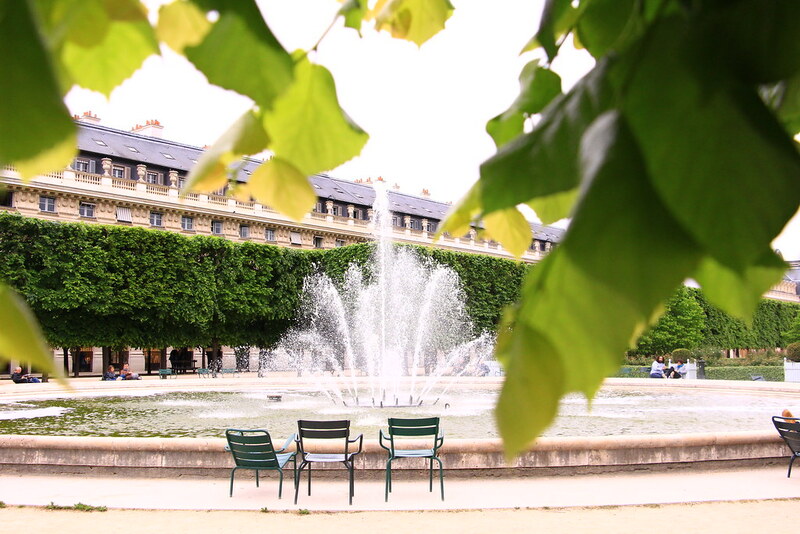 Located close to the famous Louvre, Le Jardin du Palais Royale is hidden within the busy rush of the city, offering visitors the chance to take a break and enjoy the surroundings. In this elegant courtyard, one almost feels transported back into one of the many 18th-century country gardens – with its symmetrical hedging and decorative fountain. Here you can stroll around the beautiful garden, appreciating the symmetrically lined trees and colourful flowers; or you can sit and enjoy people watching from many of the various reclining chairs around the central fountain. Cafe Kitsune, 51 Galerie de Montpensier, 75001 – this chic place offers awesome coffee, and is a favourite amongst Paris bloggers. Claus, 14 Rue Jean-Jacques Rousseau, 75001 – this is a quaint place of yummy breakfast and lunch with delicious food on offer. Frenchie To Go, 9 Rue du Nil, 75002 – Frenchie to Go has a really cool atmosphere, and even nicer sandwiches. Bioboa, 93 Rue Montmartre, 75002 – Bioboa prides itself on its organic food, I recommend the tofu burger. Liza, 14 Rue de la Banque, 75002 – this is a Lebanese restaurant, which has a stylish decor, which brings the yummy food of Beirut to Paris. 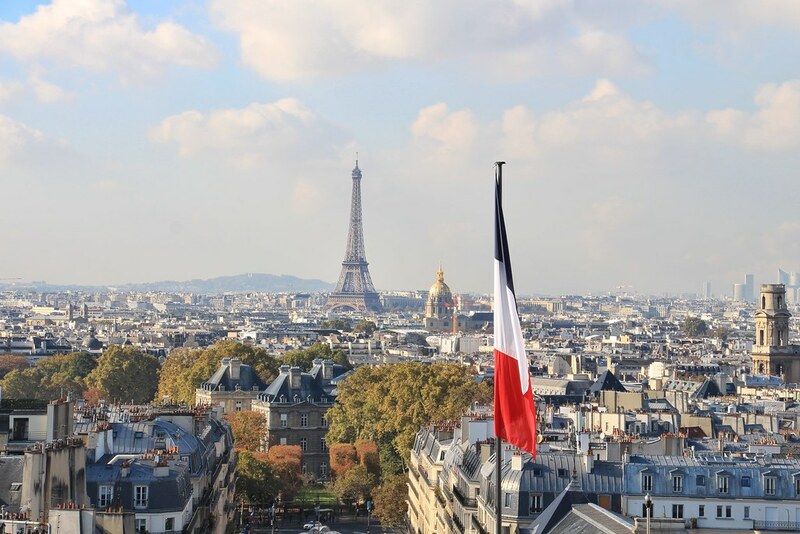 Whilst the majority of guides will point you in the direction of the Eiffel Tower, I believe that you can get even better views of the city from the Arc de Triomphe. 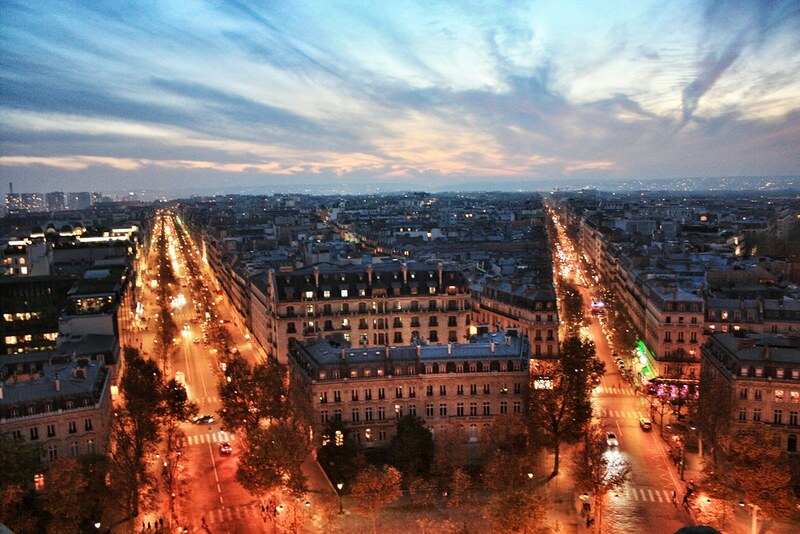 So to end the 24 hours in Paris, a trip up the Arc de Triomphe is a must, especially at sunset and into twilight. 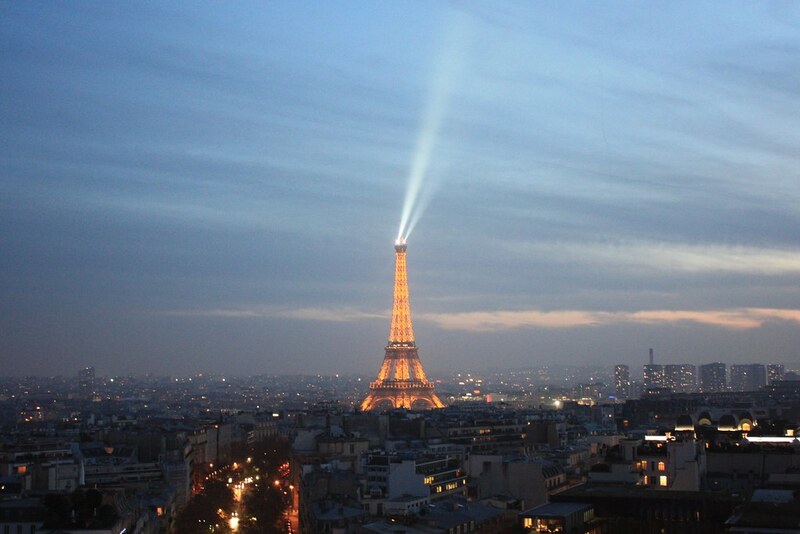 This is one of my favourite places to see the beautiful twinkling of the Eiffel Tower and the surrounding cityscape. The good news is that it is open until 11:00pm all year round! There you have it! My not so inclusive list of all the things I would recommend for you to see and do in 24 hours. There is so much that I would include on this list, but I think these are places that are great to visit any time of the year and that are all in walking distance from one another (maybe with the exception of the Arc de Triomphe, but it’s worth getting on the metro for!). Writing this has made me all nostalgic, and a little tired, as if I have taken the walk through the guide myself!